I’m going to be in for my 8th time, and with my own tools this time too. I’m also targeting Windows/Mac/Linux/Android/Html5 this time. The tools that I will be using are as follows. IRC and Slack/Skype for team communication (if I could form one). I wish everyone good luck in making your game, let’s have fun. I’m doing LD for the 7th time, and this time, I’m going to try making a HTML5 version of my game, and I have added a new backend for my own game engine. I did so much work, wrote WebGL bindings for GWT (Google Web Toolkit), written an OpenAL implementation for the web, so I might not have the time for writing a graphics abstraction and audio abstraction, so using OpenGL/OpenAL directly this time. To get easy with creating the multi project build (now the same codebase compiles to HTML5 and also desktop) I’m using Gradle, and wrote a project creator tool which allows me to quickly create a project with a package name, and the main class name. I learnt JavaFX in an hour to make this user interface, and this is what I did after coding straight for a few hours. This does most of the heavy lifting for me, as my engine has low level bindings to OpenGL/OpenAL, and a cross platform build chain, written completely in Java, using LWJGL 3 for the desktop backend, and using WebGL4J and GWT-AL which are my own libraries for the HTML5 backend. Other than those, here are the tools that I will be using for this LD. I’m aiming to learn time management this time, I have to save some time in the end for polishing my game (all my previous LD entries are unpolished unfortunately), but I have to see how I will perform, since my end semester exams in college are going on at the same time. Any way, here are the tools. And that’s it for this time friends, hope I learn something new. By the way, I’m also planning to do live streaming, mostly either on Youtube or LiveCoding.tv (I don’t like Twitch, it’s a bit hard to set up). So I’m into the compo with my engine, and I have to say I did my first day well. Here are some screenshots. That is the boss level, the mother ship spawns the child ships in five waves, and goes away. There is no death to the mother ship, because, it is a mother and we should respect it. The children can be shot though. After that, and before that, there will be again 5 waves, but this time only the children. They are generated completely randomly. That is the shield of the player, which exists for a maximum of three seconds, and can be turned on my pressing right alt key. You cannot fire when shield is on, because yeah, the shield is solid. The firing key is left alt key. Only two controls! That is the logo for this game. 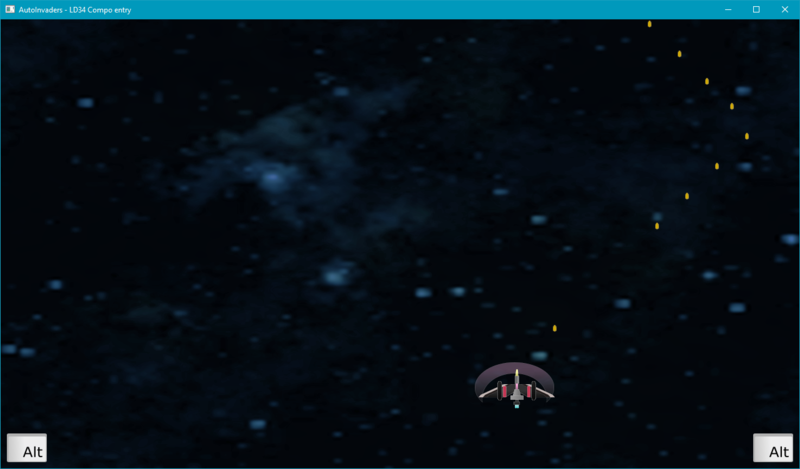 Everything is almost done and the game play is implemented. Now the remaining things for tomorrow is to implement the menus, add in score and lives, a lot of play testing, and finally SUBMITTING TO THE COMPO!! I’m in for fifth time, and this time I really like the theme. I was going to go with the theme Two button controls and I already had an idea, to remake of a great classic game that I played a lot in my childhood and I’m so sure 99% of you should have played it at least once. Anyways, I chose the controls to be LEFT ALT and RIGHT ALT as I need them to be completely far away in the keyboard, so people can play it comfortably. Gonna enjoy this time a lot more than previously. I won’t be leaking about the game until it is complete. A merry ludum dare guys! I just wanted to follow the culture, so here is my I’m in post. Here’s what I’m using to participate in this compo this time. Unfortunately, things are getting tough for me, had college on all days of LD, as August 21st being Friday and 22nd being Saturday. So I’m taking this as a challenge. The LD usually starts at (theme announcement time) 6:30 AM in the morning here, and I have to be in the bus stop by 7:30 AM, and I will return home by 6:30 PM in the evening. So my timings this time are 6:30 PM to 11:00 PM on those two days, and I think I should remove one more hour to compensate homework, dinner etc., and that means I’ll have only 10 hours on the two days to work on my LD. So still, I’ll try to complete a game this time, but maybe JAM submission. My plans to cover this is to get a quick running prototype of my game and later work on the assets so I’ll have time till the submission hour. This, is my plan for this time. Let’s hope things go well. I have just submitted my entry to the compo, it’s called as RoboFight. 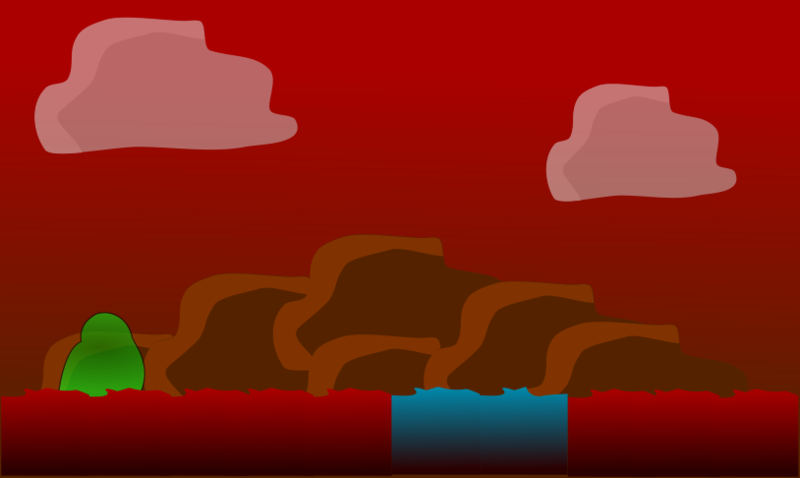 Entire art is done in Inkscape 0.91 (Even the background). SurvivorPong is now complete – Wanna try? Hi everyone, I just have submitted my MiniLD #58 entry, SurvivorPong. It is my attempt at remaking Pong by adding a bit of challenge. The idea is you have to stop a deer from running into leopards which are hiding under leaves, and the score is how much time you can survive. There is small issue for Mac users. If you want the game to run, please run the game with the command line option -XstartOnFirstThread. Otherwise LWJGL 3 won’t start and throws an exception. 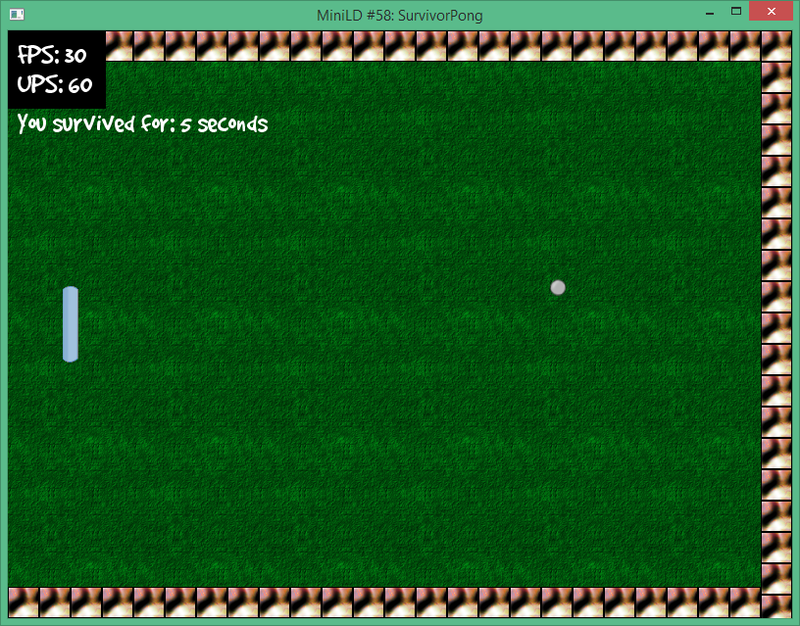 This is the end of the fourth day in the development of SurvivorPong, my MiniLD #58 entry. My plans for today included me to make some powerups for the game, but today, I violated my plans. Instead, I focused on composing some music. The music is an OGG file and is just my try at making my own music. You can hear that online from my site: http://goharsha.com/downloads/minild58/music.ogg. To compose the music, I used beepbox.co service to make this music. I have also changed my code a bit so the tempo of the song increases along with the game speed. I spent the whole day trying to make the audio and this is the result I have got now. It is 11:36 PM now here, so I have to get some sleep. I’ll have to see what I can do tomorrow with the powerup system. 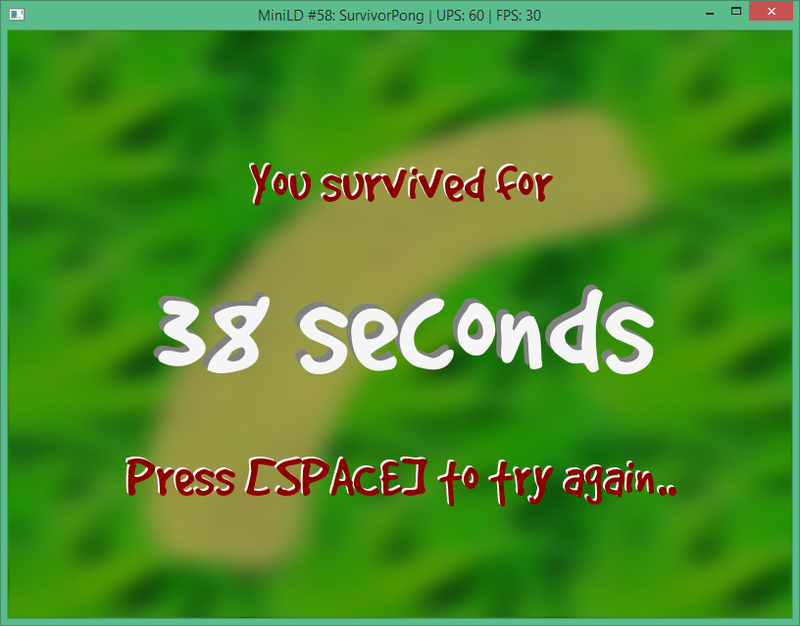 Hello guys, this is the end of the third day in the development of SurvivorPong, my MiniLD #58 entry. I had redone the graphics today, as well as I added some music to the game. 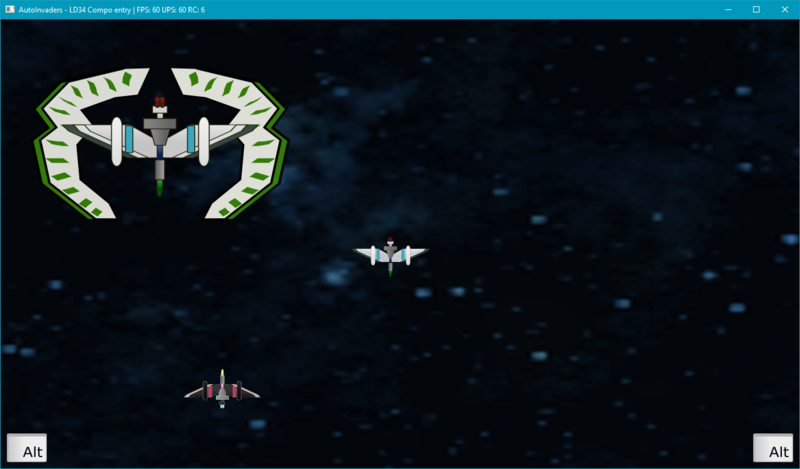 Tomorrow I will be adding some powerups. These are what I had did today. The leopards are now hidden behind leaves, I did a new background in GIMP and also the paddle is changed to a stick. I also increased a bit of game speed, and it increases from 2 pixels per frame to very high speed of 15 pixels per frame. Also now the game adapts to different aspect ratios. I also added anti-aliasing to the fonts. 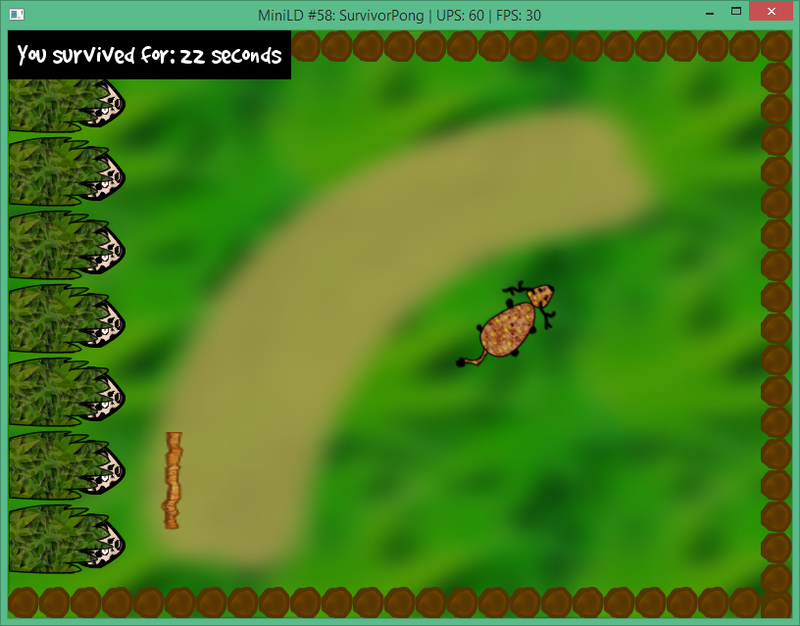 Tomorrow, I have some plans to implement some powerups, like, increase/decrease the paddle size, slow down/speed up the deer, and add some extra time to the timer. Will see you soon again guys! Hello guys, since my last post, I changed my game by adding the new sprites in the place of the placeholder art. Here is how it looks now. I added some leopards in the left and added a deer instead of the ball. Please don’t tell me that the art is crap, I have spent an entire day to draw these leopard and deer sprites. Now the game is nearing completion, I still have to make intro, story and the game over screens. See you soon after I made that. My idea to re-make Pong, how long can you survive? Hello guys, I started a little late, but I think I had got a nice idea. 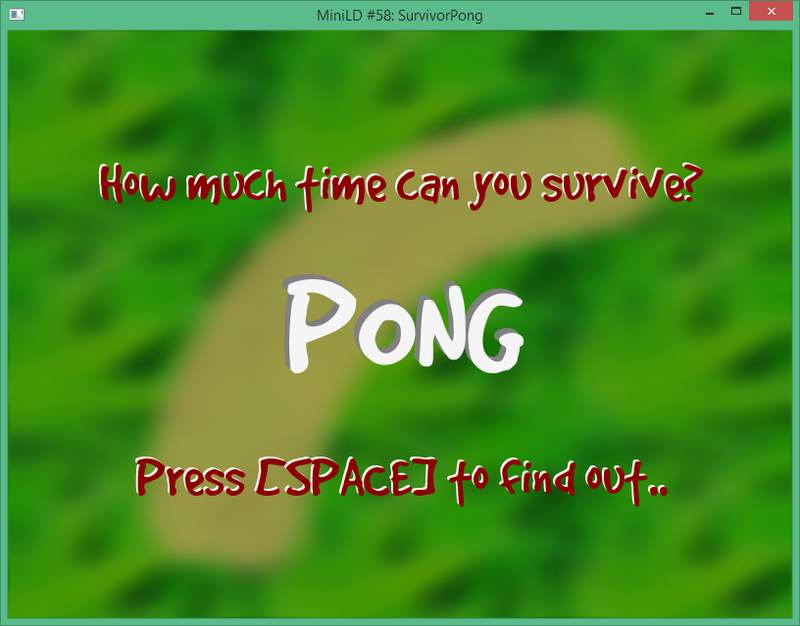 I wanted to create a Pong version that challenges the players, as how long can you survive? I have it half implemented today, so here is how it looks like now. These sprites are just place holders, and I’ll be changing it quite a bit tomorrow. My idea is to change the ball to a Deer, and add some tigers to the left of the screen. All you have to do is to stop the deer from running into the tigers, and how much time can you help survive the deer. Right now, I had got the basics of pong working. 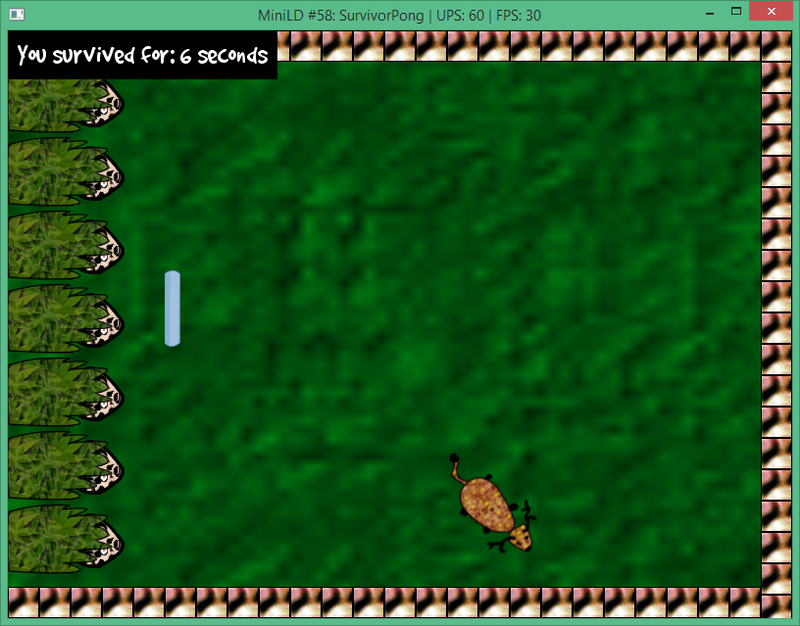 I’ll also add some powerups that increase the timer, and some traps which removes some health from the deer. When the health goes zero, or when the deer runs into a tiger, the game ends. So I have to sleep for today, and I’ll post my progress again tomorrow. See you again! LudumDare #32 – I’m in! Hello everyone, I’m Sri Harsha, and this is my second Ludum-Dare. I learnt a lot by watching others and by jumping right into game programming and I’m happy that I’m able to make a simple collectathon game in my 48 hours, it was a great experience. During that time, it was a learning experience for me, I have used a library called as Mercury (I was one of it’s contributors). One of the mistakes I have did is allocating excess time than was needed for the collision detection. I have gone for pixel-perfect collisions and I have implemented a Grid structure all by myself, when I could have got around with simple rectangles. 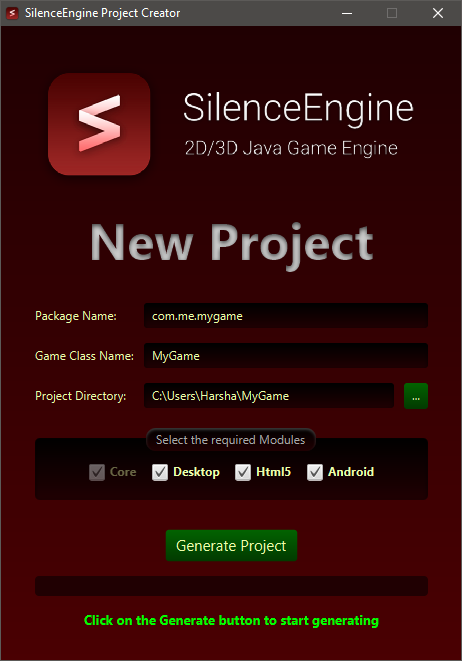 This time, I won’t do the same mistake, and I have set-up my own library to aid me called as SilenceEngine (it’s opensource) that uses OpenGL and LWJGL3. This is a good learning experience as well, I have learnt OpenGL, GLFW, OpenAL and collision algorithms such as SAT and AABBTrees for broad-phase. This coming LD will be my testing ground for what I have learnt. These are the tools that I will be using in this LD. I’ll have to see what I can do this time! Wish me luck friends! Anyways, I will be enjoying this event. Thanks a lot for organizing this worderful and fabulous event!